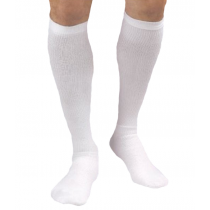 Knee high compression socks, from leading manufacturers in compression therapy, offer graduated compression to assist with several leg and foot ailments, such as varicose veins; legs, ankles and feet swelling; muscle fatigue and deep vein thrombosis. Depending upon your specific and individual needs, you will need to choose the right compression level to properly facilitate relief. Compression levels range anywhere from 8 to 15 mmHg to 40 to 50 mmHg. This compression amount is measured through millimeters of mercury, similar to how blood pressure is measured. Specifically, a lower level of compression is an excellent choice for everyday compression stockings to assist with relieving fatigued legs and mild swelling. The higher compression levels assist with more pressing conditions. To ensure that you choose the best compression amount for your individual needs, please confer with your medical provider. Compression therapy becomes easy and convenient with our wide selection of knee high compression stockings for women. To find the best compression stockings, look through our wide selection of knee high compression stockings for women, from leading manufacturers in compression therapy, today! 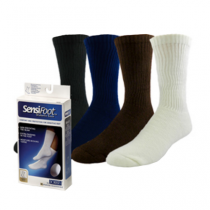 8-15 mmHg Compression is indicated for: fatigued legs, mild aching, prophylaxis during pregnancy, mild edema of the ankle or foot, mild varicosities and post sclerotherapy. 15-20 mmHg Compression is indicated for: heaviness and fatigue in the leg, mild varicose veins during pregnancy, mild varicose veins without edema, prophylaxis during travel or for immobile patients. 20-30 mmHg Compression is indicated for: varicose veins during pregnancy, varicose veins with mild edema, DVT, Post-op, CVI, managing healed venous ulcer and Post-thrombotic syndrome. 30-40 mmHg Compression is indicated for: pronounced varicoses with severe edema, severe CVI, recurrent or active ulcers, severe post-traumatic edema, and lymphedema. 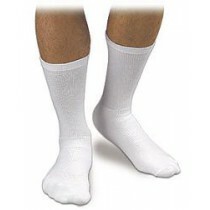 40-50 mmHg Compression is indicated for: severe post-thrombotic syndrome and severe lymphedema.